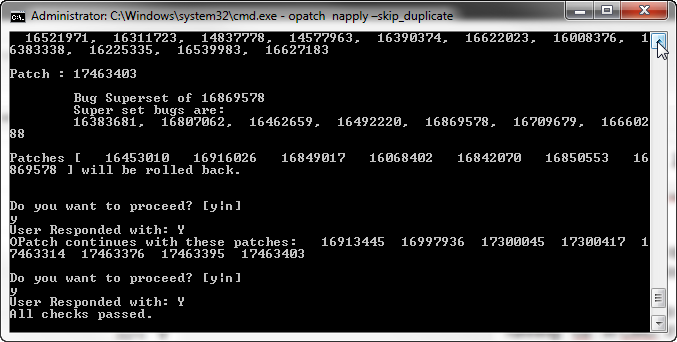 First download the single big patch file of Patch 17530796 and the small file of Patch 16569379 (you need 16569379 only if you didn't install it with 11.1.1.7.1) as described in OBIEE BUNDLE PATCH 11.1.1.7.131017 AKA 11.1.1.7.2 or 11.1.1.7.3 is available. Don't know why, but I had trouble downloading the WIN64 patch with Firefox (all 4 time failed), while Chrome did the job well. Now in the directory 17530796, you have 8 zip files and a useful readme.htm. 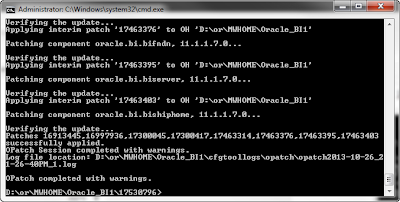 You are advised by the readme to move the 17530796 directory to prod_mwhome\Oracle_BI1. Unzip all 8 zip files. 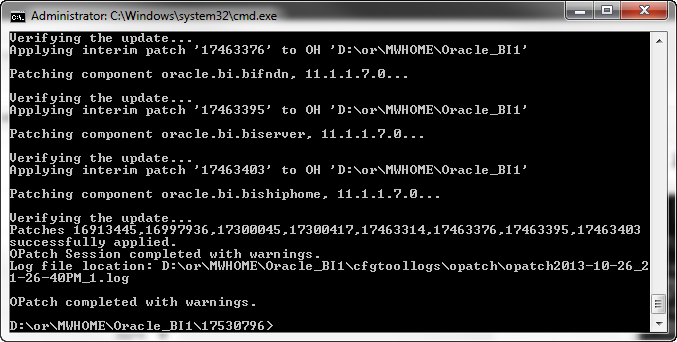 At the moment you should have 8 directories under prod_mwhome\Oracle_BI1\17530796. PLEASE read carefully section 3.1 if you are upgrading from 11.1.1.6.X. In my case it's D:\or\MWHOME\Oracle_BI1\bifoundation\server and D:\or\MWHOME\instances\instance1\bifoundation\OracleBIServerComponent\coreapplication_obis1\repository. I prefer to backup D:\or\MWHOME\instances\instance1\bifoundation\OracleBIPresentationServicesComponent\coreapplication_obips1\catalog as well. In point 3 you are advised to stop the BI System and told how to do it, step by step. It's all very nice but to me it looks simpler just to run "Stop BI Services" from the Start/All Programs/Oracle Business Intelligence menu. I guess wee see the full details due to Linux needs (and anyway, it's very educational). Point 4 advises to clear cache: from prod_mwhome\Oracle_BI1\bifoundation\web\catalogmanager\configuration\ (in my case D:\or\MWHOME\Oracle_BI1\bifoundation\web\catalogmanager\configuration\) you should delete 2 files (if they exist) org.eclipse.osgi & org.eclipse.equinox.app. As you remember we have directory 17530796 with 8 sub-directories in prod_mwhome\Oracle_BI1 (in my case D:\or\MWHOME\Oracle_BI1). make sure the extracted directory 16569379 is under prod_mwhome\Oracle_BI1 as well, only if you didn't install this patch before (you did, if you installed 11.1.1.7.1). 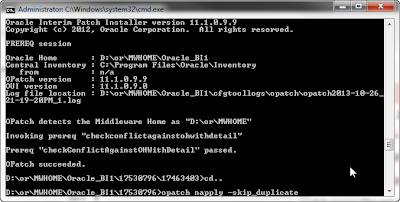 Open CMD prompt as Administrator on prod_mwhome\Oracle_BI1. (Right Click with Shift pressed on the CMD or Right Click and CMD here as Administrator in the File Browser). 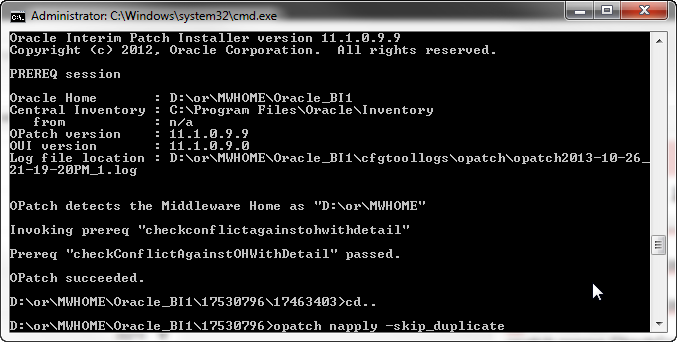 DON'T leave empty spaces in the set, such as set ORACLE_HOME= D:\or\MWHOME\Oracle_BI1. My system is 11.1.1.7.1 so I was asked twice "Do you want proceed?" 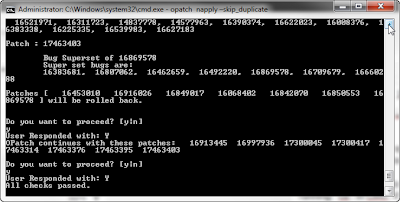 And was asked to be sure "the local system is ready for patching" (shut down). From what I see in the log, it's all because of previous patches (11.1.1.7.1 ?) components that are replaced by newer ones. In my case, from D:\or\MWHOME\Oracle_BI1\clients\bipublisher\repository\Tools to D:\or\MWHOME\user_projects\domains\bifoundation_domain\config\bipublisher\repository\Tools. There seems to be a problem here since the source does not exist. I don't know if it's a documentation bug or missing file. Had the same thing in 11.1.1.7.1. You are advised there to download the new SmartView here. Both zip files seem to be the same. They contain both SmartView files (the 32 and 64 bit). "With the availability of Oracle Business Intelligence Enterprise Edition release 11.1.1.7.1, it will no longer be possible to make use of the default Oracle Smart View client installer which is available through the Oracle BI EE Home Page. For this release only, it will be necessary to access an updated version of the Oracle Smart View client installer version 11.1.2.3.000_16909989 (from My Oracle Support), or later. 2. Make backup copies of smartview.exe and version.xml before deploying the replacement files. 3. Download the Smart View zip file from My Oracle Support. 5. Copy smartview.exe and version.xml to the location of the Workspace installation, typically: C:\Oracle\Middleware\EPMSystem11R1\common\epmstatic\wspace\SmartView"
Well you don't have to go to support... you just downloaded the zip file. Backup <Oracle BI Home>\clients\epm\SmartView (In my caseD:\or\MWHOME\Oracle_BI1\clients\epm\SmartView), extract the content of the Zip file to that directory. Now you can Start up the server. Bon Voyage. 1.Copy the BIChart.swf file from the <Oracle BI Home>\bifoundation\web\app\res\sk_blafp\dvt directory to each custom directory in the BI System, replacing the existing file of that name. 1. Navigate to the /instances/instance1/config/OracleBIJavaHostComponent folder. b . In the xdo.cfg file, change the setting for xlsx-keep-values-in-same-column to True. 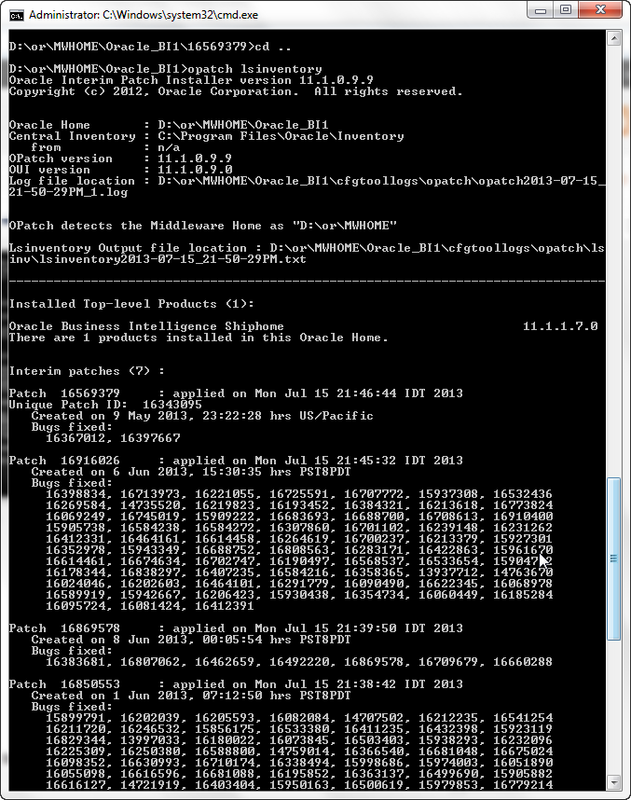 (See note 1632002.1 at Oracle Support if you don't know what they are talking about). 3. Restart the WebLogic Administration Server (and Managed Server and BI System). Remember to upgrade the Admin Clients, otherwise you will get an Error.